Many authors distinguish spontaneous pneumomediastinum as a form of pneumomediastinum that is not associated with blunt force or penetrating chest trauma, endobronchial or esophageal procedures, neonatal lung disease, mechanical ventilation, or chest surgery or other invasive procedures. Because of the infrequent occurrence of pneumomediastinum, the literature relating to pneumomediastinum involves individual case reports or small case series and is retrospective in nature. The following images demonstrate radiographic findings in patients with pneumomediastinums. This chest radiograph (posteroanterior and lateral view) is from a 3-year-old girl with a history of prematurity, chronic lung disease, and asthma who presented with a viral pneumonitis and persistent cough. On the posteroanterior view, a pneumomediastinum (arrow) is noted. Also, extensive subcutaneous air is observed. On the lateral radiograph from the patient in Media file 2, anterior mediastinal air is observed. Left lower lobe atelectasis is also present. The child was asymptomatic and was discharged 2 days later. Chest radiographs in anteroposterior (AP) and lateral projections obtained in a 9-year-old girl with wheezing and pneumonitis. The arrows highlight the "spinnaker sail sign" in which free mediastinal air lifts the thymus off of the heart and major vessels. The generally accepted explanation for the development of pneumomediastinum is that free air tracks from ruptured alveoli along peribronchial vascular sheaths toward the hilum of the lung. From there, it extends proximally within the mediastinum. The Macklin effect, first described in 1939, highlights the sequence of events in the development of pneumomediastinum as follows: (1) alveolar rupture, (2) air dissection along the bronchovascular sheath, and (3) free air reaching the mediastinum. The dissection of free air may not be confined solely to the mediastinum. Zylak et al note that the mediastinum communicates with the submandibular space, the retropharyngeal space, and vascular sheaths within the neck. In addition, 2 routes of communication with the retroperitoneum have been noted: via a tissue plane extending through the sternocostal attachment to the diaphragm, as well as periaortic and periesophageal fascial planes. As a result, air present within the mediastinum may dissect through these tissue planes, causing pneumopericardium, pneumothorax, subcutaneous emphysema, pneumoperitoneum, or pneumoretroperitoneum. The epidemiology of pneumomediastinum reflects that of the associated disease states, when present. A study from Nashville, Tennessee, reported the frequency of extra-abdominal gas in a series of patients undergoing laparoscopic esophageal surgery. Forty-seven percent of patients (N = 45) had evidence of extra-abdominal air on chest radiography. Of these, 86% had a pneumomediastinum. Pneumomediastinum persisted at least 1 postoperative day in two thirds of these cases. However, no mortality or morbidity was attributable to the presence of pneumomediastinum. In a series of patients with sepsis-induced acute respiratory distress syndrome (ARDS), air leaks of any type, excluding pneumothorax, occurred in 3.7% of patients. Ventilator pressures and volumes delivered were not correlated with the development of air leak. A study by Briassoulis et al from Athens, Greece, evaluating the frequency of air leaks in children receiving mechanical ventilation reported a prevalence of 27%. However, they did not report the prevalence of specific types of air leak. Esayag et al reported an Israeli series of 13 patients with spontaneous pneumomediastinum. This group represented 1 in 41,600 referrals to the emergency room and 1 in 15,500 hospitalizations. The median age of the patients was 19 years (range 2–72 y). Males comprised 77% of this group. A case series from the Children's Medical Center, China Medical University in Taiwan reported by Lee et al defined an incidence of spontaneous pneumomediastinum in children of 1:8,302 patient visits to the pediatric emergency department. They observed a bimodal distribution, with cases occurring in children younger than 4 years old and in adolescents aged 15-18 years. Males outnumbered females by a ratio of 4:1. The mortality and morbidity associated with pneumomediastinum are generally attributable to underlying disease states. Spontaneous pneumomediastinum is usually a self-limited condition that rarely produces significant or life-threatening symptoms. The mortality rate associated with pneumomediastinum may be as high as 50-70% as seen in Boerhaave syndrome (esophageal rupture following vomiting). The development of air leak, according to Weg et al, is not associated with an increased mortality rate in patients with sepsis-induced ARDS. Other predisposing conditions associated with high mortality rates include trauma (blunt and penetrating, especially high velocity injury), asthma, and tracheobronchial perforation. The most common morbidities attributable to pneumomediastinum are symptoms such as chest pain, voice change, and cough. Rarely, tension pneumomediastinum may result in decreased cardiac output. Laryngeal compression leading to stridor has been reported. Gas embolism has rarely been reported. In a series of pneumomediastinum occurring in persons with asthma, there was a very slight male predominance in the prevalence of spontaneous pneumomediastinum. Other series confirm this excess of male cases. Damore reported 29 cases of pneumomediastinum over a 10-year period unrelated to trauma, intubation, or surgical procedures; 69% of patients were male. Some have suggested that a body habitus favoring a tall thin build is an additional risk factor for the development of spontaneous pneumomediastinum. The mechanisms underlying this association are unclear. Traumatic pneumomediastinum is more common in males, reflecting the male predominance among those who experience trauma and accidents. The peak prevalence of spontaneous pneumomediastinum is seen in the second to fourth decades of life. This presumably reflects involvement in activities that increase the risk for developing pneumomediastinum, such as diving or marked physical exertion (eg, athletic activities, weight lifting). Moreover, the force of an individual's cough, vomit, and Valsalva maneuvers (all of which may lead to pneumomediastinum) attenuates with age, accounting for the decline in the prevalence of pneumomediastinum with age. The age distribution for pneumomediastinum occurring in conjunction with specific disease processes reflects the age profile of the particular disease. Gasser CR, Pellaton R, Rochat CP. Pediatric Spontaneous Pneumomediastinum: Narrative Literature Review. Pediatr Emerg Care. 2016 Feb 6. [Medline]. Jennings S, Peeceeyen S, Horton M. Tension pneumomediastinum after blunt chest trauma. ANZ J Surg. 2013 Oct 31. [Medline]. Zylak CM, Standen JR, Barnes GR, Zylak CJ. Pneumomediastinum revisited. Radiographics. 2000 Jul-Aug. 20(4):1043-57. [Medline]. [Full Text]. Carolan PL, Wright SL, Jha V. Spontaneous pneumorrhachis. Pediatr Emerg Care. 2013 Apr. 29(4):508-9. [Medline]. Wong KS, Wu HM, Lai SH, Chiu CY. Spontaneous pneumomediastinum: analysis of 87 pediatric patients. Pediatr Emerg Care. 2013 Sep. 29(9):988-91. [Medline]. Chalumeau M, Le Clainche L, Sayeg N, et al. 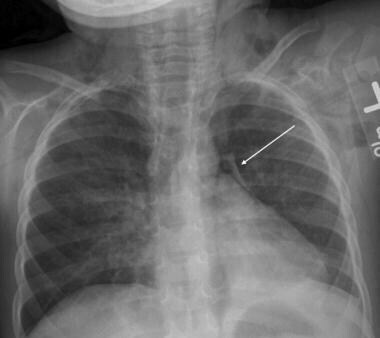 Spontaneous pneumomediastinum in children. Pediatr Pulmonol. 2001 Jan. 31(1):67-75. [Medline]. Stack AM, Caputo GL. Pneumomediastinum in childhood asthma. Pediatr Emerg Care. 1996 Apr. 12(2):98-101. [Medline]. Vianello A, Caminati M, Chieco-Bianchi F, Marchi MR, Vio S, Arcaro G, et al. Spontaneous pneumomediastinum complicating severe acute asthma exacerbation in adult patients. J Asthma. 2017 Oct 9. 1-7. [Medline]. Weg JG, Anzueto A, Balk RA, et al. The relation of pneumothorax and other air leaks to mortality in the acute respiratory distress syndrome. N Engl J Med. 1998 Feb 5. 338(6):341-6. [Medline]. Briassoulis GC, Venkataraman ST, Vasilopoulos AG, et al. Air leaks from the respiratory tract in mechanically ventilated children with severe respiratory disease. Pediatr Pulmonol. 2000 Feb. 29(2):127-34. [Medline]. Esayag Y, Furer V, Izbicki G. Spontaneous pneumomediastinum: is a chest X-ray enough? A single-center case series. Isr Med Assoc J. 2008 Aug-Sep. 10(8-9):575-8. [Medline]. Lee CY, Wu CC, Lin CY. Etiologies of spontaneous pneumomediastinum in children of different ages. Pediatr Neonatol. 2009 Oct. 50(5):190-5. [Medline]. Damore DT, Dayan PS. Medical causes of pneumomediastinum in children. Clin Pediatr (Phila). 2001 Feb. 40(2):87-91. [Medline]. MacKnight JM, Mistry DJ. Chest Pain in the Athlete: Differential Diagnosis, Evaluation, and Treatment. Lawless CE. Sports Cardiology Essentials. New York: Springer; 2011. 115-140. Kim KS, Jeon HW, Moon Y, Kim YD, Ahn MI, Park JK, et al. Clinical experience of spontaneous pneumomediastinum: diagnosis and treatment. J Thorac Dis. 2015 Oct. 7 (10):1817-24. [Medline]. Okada M, Adachi H, Shibuya Y, Ishikawa S, Hamabe Y. Diagnosis and treatment of patients with spontaneous pneumomediastinum. Respir Investig. 2014 Jan. 52(1):36-40. [Medline]. Walsh-Kelly C, Kelly KJ. Dysphonia: an unusual presentation of spontaneous pneumomediastinum. Pediatr Emerg Care. 1986 Mar. 2(1):26-7. [Medline]. Huon LK, Chang YL, Wang PC, Chen PY. Head and neck manifestations of spontaneous pneumomediastinum. Otolaryngol Head Neck Surg. 2012 Jan. 146(1):53-7. [Medline]. 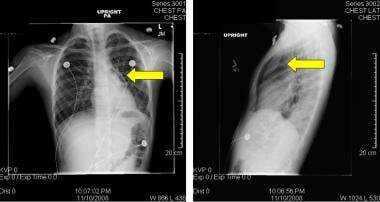 Hochlehnert A, Löwe B, Bludau HB, Borst M, Zipfel S, Herzog W. Spontaneous pneumomediastinum in anorexia nervosa: a case report and review of the literature on pneumomediastinum and pneumothorax. Eur Eat Disord Rev. 2010 Mar. 18(2):107-15. [Medline]. Makdsi F, Kolade VO. Diabetic ketoacidosis with pneumomediastinum: a case report. Cases J. 2009 Sep 9. 2:8095. [Medline]. [Full Text]. Kouki S, Fares AA. Postpartum spontaneous pneumomediastinum 'Hamman's syndrome'. BMJ Case Rep. 2013 Sep 3. 2013:[Medline]. Perna V, Vilà E, Guelbenzu JJ, Amat I. Pneumomediastinum: is this really a benign entity? When it can be considered as spontaneous? Our experience in 47 adult patients. Eur J Cardiothorac Surg. 2010 Mar. 37(3):573-5. [Medline]. Sahni S, Verma S, Grullon J, Esquire A, Patel P, Talwar A. Spontaneous Pneumomediastinum: Time for Consensus. N Am J Med Sci. 2013 Aug. 5(8):460-464. [Medline]. [Full Text]. Banki F, Estrera AL, Harrison RG, Miller CC 3rd, Leake SS, Mitchell KG, et al. Pneumomediastinum: etiology and a guide to diagnosis and treatment. Am J Surg. 2013 Dec. 206(6):1001-6. [Medline]. Jones R, Kundrotas L. "HOOAH!" A case of pneumomediastinum in the military training environment; Hamman's sign 71 years later. Mil Med. 2011 Mar. 176(3):352-5. [Medline]. Sadarangani S, Patel DR, Pejka S. Spontaneous pneumomediastinum and epidural pneumatosis in an adolescent precipitated by weight lifting: a case report and review. Phys Sportsmed. 2009 Dec. 37(4):147-53. [Medline]. Vazquez JL, Vazquez I, Gonzalez ML, Garcia-Tejedor JL, Reparaz A. Pneumomediastinum and pneumothorax as presenting signs in severe Mycoplasma pneumoniae pneumonia. Pediatr Radiol. 2007 Dec. 37(12):1286-8. [Medline]. Megremis S, Stefanaki S, Tsekoura T, Tsilimigaki A. Spontaneous pneumomediastinum in a child: sonographic detection in a case with minimal findings on chest radiography. J Ultrasound Med. 2008 Feb. 27(2):303-6. [Medline]. Lin HW, Kakarala K, Ostrower ST, Leonard DS. Laryngotracheobronchitis complicated by spontaneous pneumomediastinum. Int J Pediatr Otorhinolaryngol. 2010 Feb. 74(2):221-4. [Medline]. Hasegawa M, Hashimoto K, Morozumi M, Ubukata K, Takahashi T, Inamo Y. Spontaneous pneumomediastinum complicating pneumonia in children infected with the 2009 pandemic influenza A (H1N1) virus. Clin Microbiol Infect. 2010 Feb. 16(2):195-9. [Medline]. Rezende-Neto JB, Hoffmann J, Al Mahroos M, Tien H, Hsee LC, Spencer Netto F, et al. Occult pneumomediastinum in blunt chest trauma: clinical significance. Injury. 2010 Jan. 41(1):40-3. [Medline]. Ho AS, Ahmed A, Huang JS, Menias CO, Bhalla S. Multidetector Computed Tomography of Spontaneous Versus Secondary Pneumomediastinum in 89 Patients: Can Multidetector Computed Tomography be Used to Reliably Distinguish Between the 2 Entities?. J Thorac Imaging. 2012 Mar. 27(2):85-92. [Medline]. Dissanaike S, Shalhub S, Jurkovich GJ. The evaluation of pneumomediastinum in blunt trauma patients. J Trauma. 2008 Dec. 65(6):1340-5. [Medline]. Lee WS, Chong VE, Victorino GP. Computed Tomographic Findings and Mortality in Patients With Pneumomediastinum From Blunt Trauma. JAMA Surg. 2015 Aug. 150 (8):757-62. [Medline]. Wu CH, Chen CM, Chen CC, Wong YC, Wang CJ, Lo WC, et al. Esophagography after pneumomediastinum without CT findings of esophageal perforation: is it necessary?. AJR Am J Roentgenol. 2013 Nov. 201(5):977-84. [Medline]. Castellote A, Vazquez E, Vera J, et al. Cervicothoracic lesions in infants and children. Radiographics. 1999 May-Jun. 19(3):583-600. [Medline]. [Full Text]. Macia I, Moya J, Ramos R, et al. Spontaneous pneumomediastinum: 41 cases. Eur J Cardiothorac Surg. 2007 Jun. 31(6):1110-4. [Medline]. Neal MD, Sippey M, Gaines BA, Hackam DJ. Presence of pneumomediastinum after blunt trauma in children: what does it really mean?. J Pediatr Surg. 2009 Jul. 44(7):1322-7. [Medline]. Haam SJ, Lee JG, Kim DJ, Chung KY, Park IK. Oesophagography and oesophagoscopy are not necessary in patients with spontaneous pneumomediastinum. Emerg Med J. 2010 Jan. 27(1):29-31. [Medline]. Cunningham LC, Jatana KR, Grischkan JM. Conservative management of iatrogenic membranous tracheal wall injury: a discussion of 2 successful pediatric cases. JAMA Otolaryngol Head Neck Surg. 2013 Apr. 139(4):405-10. [Medline]. Chau HH, Kwok PC, Lai AK, et al. 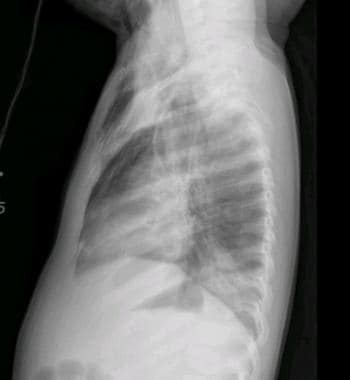 Percutaneous relief of tension pneumomediastinum in a child. Cardiovasc Intervent Radiol. 2003 Nov-Dec. 26(6):561-3. [Medline]. [Guideline] Global Initiative for Asthma (GINA). Global strategy for asthma management and prevention. Bethesda (MD): Global Initiative for Asthma (GINA); 2008. Fitzwater JW, Silva NN, Knight CG, Malvezzi L, Ramos-Irizarry C, Burnweit CA. Management of spontaneous pneumomediastinum in children. J Pediatr Surg. 2015 Jun. 50(6):983-6. [Medline]. Muckart DJJ, Hardcastle TC, Skinner DL. Pneumomediastinum and pneumopericardium following blunt thoracic trauma: much ado about nothing?. Eur J Trauma Emerg Surg. 2018 Apr 23. [Medline]. Gasser CR, Pellaton R, Rochat CP. Pediatric Spontaneous Pneumomediastinum: Narrative Literature Review. Pediatr Emerg Care. 2017 May. 33 (5):370-374. [Medline]. Bagga B, Kumar A, Chahal A, Gamanagatti S, Kumar S. Traumatic Airway Injuries: Role of Imaging. Curr Probl Diagn Radiol. 2018 Oct 29. [Medline]. Majerus CR, Tredway TL, Yun NK, Gerard JM. Utility of Chest Radiographs in Children Presenting to a Pediatric Emergency Department With Acute Asthma Exacerbation and Chest Pain. Pediatr Emerg Care. 2018 Sep 25. [Medline]. Vanden Berghe S, Devlies F, Seynaeve P. The Spinnaker-Sail Sign: Neonatal Pneumomediastinum. J Belg Soc Radiol. 2018 Aug 7. 102 (1):51. [Medline]. Popik E, Barroso F, Domingues S, Araújo LN, Carvalho C, Fonte M. Spontaneous neonatal pneumomediastinum and spinnaker-sail sign. J Paediatr Child Health. 2018 Nov. 54 (11):1273. [Medline]. Ehmann MR, Paziana K, Stolbach AI. Case Series: Pneumorrhachis Secondary to Spontaneous Pneumomediastinum. J Emerg Med. 2016 Feb. 50 (2):e43-5. [Medline]. Liu YW, Kao CN, Wang YM. Pneumorrhachis: an under-recognized entity correlates with severity of spontaneous pneumomediastinum. J Thorac Dis. 2018 Feb. 10 (2):E149-E151. [Medline]. Behr G, Mema E, Costa K, Garg A. Proportion and Clinical Relevance of Intraspinal Air in Patients With Pneumomediastinum. AJR Am J Roentgenol. 2018 Aug. 211 (2):321-326. [Medline]. The chest radiograph is taken from an adolescent girl with status asthmaticus who was intubated for respiratory failure. A rim of air consistent with a pneumomediastinum may be observed along the upper left border of the heart. Subcutaneous air is observed in the soft tissues of the neck. She required very high peak inspiratory pressures (50 cm H2), which in conjunction with marked air trapping due to her asthma, caused alveolar rupture, allowing air to track to the mediastinum. A central venous line was placed. Disclosure: Received honoraria from Genentech for speaking and teaching; Received honoraria from Genentech for consulting; Partner received consulting fee from Boston Scientific for consulting; Received honoraria from Gilead for speaking and teaching; Received consulting fee from Caremark for consulting; Received honoraria from Vertex Pharmaceuticals for speaking and teaching.